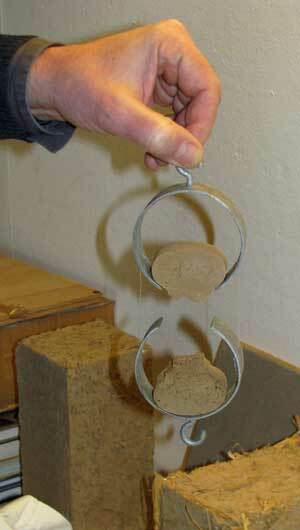 Architect Franz Volhard ignited the modern interest in straw-clay as a building material with his seminal 1983 book "Leichtlehmbau: alter Baustoff—neue Technik" (translated "Light Loam [or Clay] Construction: Old Material, New Technique"). Volhard's early interest was in studying centuries-old German buildings in order to restore and adapt them. His careful investigations and documentation led him to reinvent the material for modern use and inspire designers and builders on both sides of the Atlantic. In the early 1990s, with the book unavailable in the USA, we worked from poor photocopies and coaxed translations of portions from German-speaking friends. 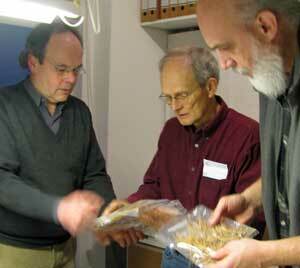 In 2009 we spent several days with Franz at his home office in Darmstadt. 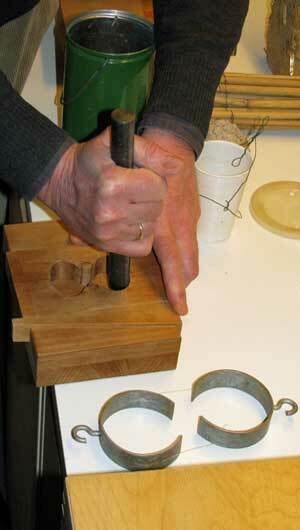 above: Volhard demonstrates the equipment he invented to compare the adhesion properties of various clay samples. 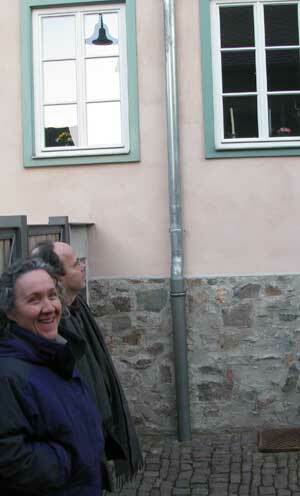 left: Franz gives us a tour of a ±400 year old building built of straw clay which has recently been remodeled into high-end condominium units. 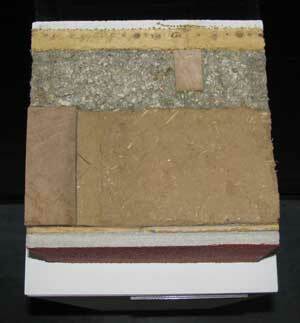 below: a model section showing composite construction: double-stud wall framing with heavy straw clay mass infill, cellulose insulation and rock-wool type rigid board. 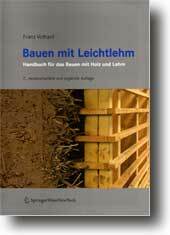 Volhard recently released an updated "Bauen mit Leichtlehm: Hanbuch fur das Bauen mit Holz und Lehm" (Building with Light Clay: Handbook for Building with Straw and Clay), published in German and French editions.